If you are looking for a supplement that will benefit your joints, you’ve probably heard a lot about ingredients like glucosamine and chondroitin, and maybe even hyaluronic acid. But here’s one you may not know about –and it’s critical to your joint comfort. Boron is a mineral that we should be getting in our diets, but most of us simply aren’t – at least not in the amounts we should. Due to soil depletion, there isn’t much boron left in the soil where our crops are grown in the U.S. Less boron in the soil means less boron in the crops we grow, which means less boron in our diets. Studies have indicated that in areas where people consume small amounts of boron, incidences of problematic joints are higher than in areas where people consume more boron. See, boron naturally helps to promote a healthy inflammatory response. Inflammation is part of what contributes to the degradation – the general wear and tear – of joints, which in turn, causes our pain. So the presence of proper amounts of boron in our bodies helps boost the overall health of our joints. That sounds pretty important! 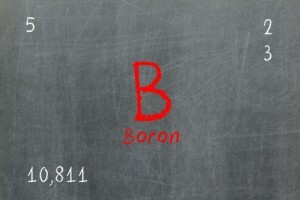 Studies done on the effects of boron have been consistently impressive. In one study, groups with mild to moderate symptoms found “substantial improvement” in the categories of pain, stiffness, and overall joint function. Even when looking at passive movement, which is when someone moves our joints for us, study participants taking boron reported “significantly less pain” than those on the placebo. And the average condition of study participants with symptoms ranging from mild all the way to severe was “significantly better” than the patients in the placebo group. In another study, participants with symptoms from mild to severe all experienced improvement, thanks to the addition of boron, as calcium fructoborate, to their daily routine. Bottom line -- our bodies need certain amounts of boron for our joints to move smoothly and comfortably. And most of us aren’t getting enough. But with the proper amounts of this powerful mineral, like the amount of boron in SynerFlex joint health formula, our joints can be healthier, move easier, and just plain feel good. And don’t you deserve that? Click here for more information on SynerFlex or to order your supply today.